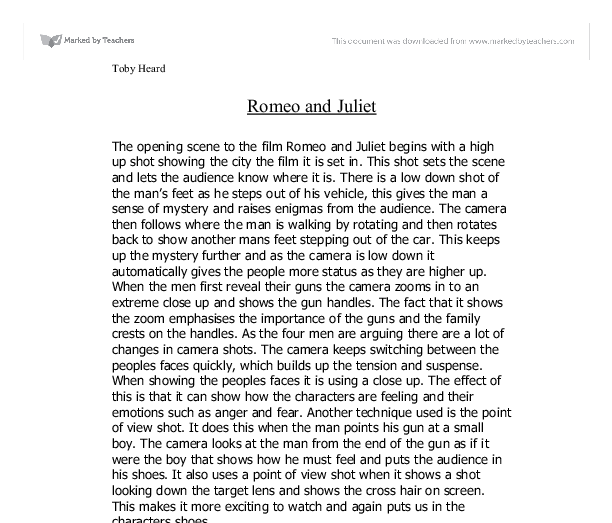 The opening scene to the film Romeo and Juliet. Romeo and Juliet The opening scene to the film Romeo and Juliet begins with a high up shot showing the city the film it is set in. This shot sets the scene and lets the audience know where it is. There is a low down shot of the man's feet as he steps out of his vehicle, this gives the man a sense of mystery and raises enigmas from the audience. The camera then follows where the man is walking by rotating and then rotates back to show another mans feet stepping out of the car. This keeps up the mystery further and as the camera is low down it automatically gives the people more status as they are higher up. When the men first reveal their guns the camera zooms in to an extreme close up and shows the gun handles. The fact that it shows the zoom emphasises the importance of the guns and the family crests on the handles. As the four men are arguing there are a lot of changes in camera shots. ...read more. There are also some special effects used in the sequence although not that many. There are a lot of sounds added over the top of the action to add to the excitement of the film. As the character takes off his jacket there is a noise added to make it seem a lot more classy and exciting. The noise of the guns clicking is made to be a lot louder. This makes it seem a lot more interesting and more thrilling. This is also done with the sound of the shots being fired. As the man steps on the match to put it out the crunch of it is made to be a lot louder and this gives a sinister feel. It may have certain connotations with the noise, such as bones crunching. In the fighting sequence there is a slow motion jump. The effect of this is that it makes it seem a lot more impressive and makes it more visually exciting for the audience. It also keeps up the suspense of the action. ...read more. This emphasises the later violence and brings shock as it is in contrast to the nuns. The fight takes place in a petrol station, which already starts making the audience think of the possibilities, as it is a dangerous place to be with firearms. One of the men has a black eye. The effect of this is that it makes him seem like he may have had previous fights and may be dangerous. Which warns the audience of what may be to come. When the man points his gun at the boy, the boy is wearing a very smart uniform. This makes him seem a lot more innocent and makes us feel more sorry for him. One of the men is wearing shoes with metal heels and he has lots of guns and gun straps, which make him seem more professional and dangerous. There are a lot of Christian related things in the sequence, such as the nuns, the cross on the mans head and the picture pf Jesus on the mans vest. These emphasis the violence as it is complete contrast with religious things. At the end of the sequence I watched there is a shot of a fire. This shows evilness and sinister ness. Toby Heard ...read more. if there was no light, then no-one would be able to see the performance. The lighting helped us achieve the correct atmosphere needed for each and every scene. Kissing you We didn't actually use this piece of music at all, but we were going to use this on the scene where everybody died, but no-one seemed to have the tape. time, I was able to tell the others to keep quiet and try everyone's ideas one after the other and see which fits best. I also kept reminding my group of our time limit. Anastasia - She is a very opinionated person and always made sure that she got her ideas across before giving up. Juliet pretends to agree to her father's wishes and acts as if she is happy to be married. Her father is so happy that the wedding is moved up one day. Juliet becomes afraid that the plan will not work, becoming doubtful of the Friar. I think the director is using this type of long shot to show that the two families are business rivals as we can see the two skyscrapers, which creates impact and suspense for the audience. 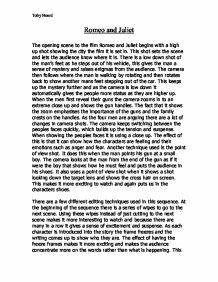 Another example of a long shot is when Tybalt is shooting Benvolio from a distance. Zoom-ins are used to draw the audience into a specific part to add an effect that can only be gained if the outcome of an event is viewed instantly. A zoom-in was used when Sampson fell over in the car. The light was turned down to a dim light and also aided to the mood of the performance. If an audience were to watch a sound collage and close their eyes, they would get the atmosphere of what is being shown.